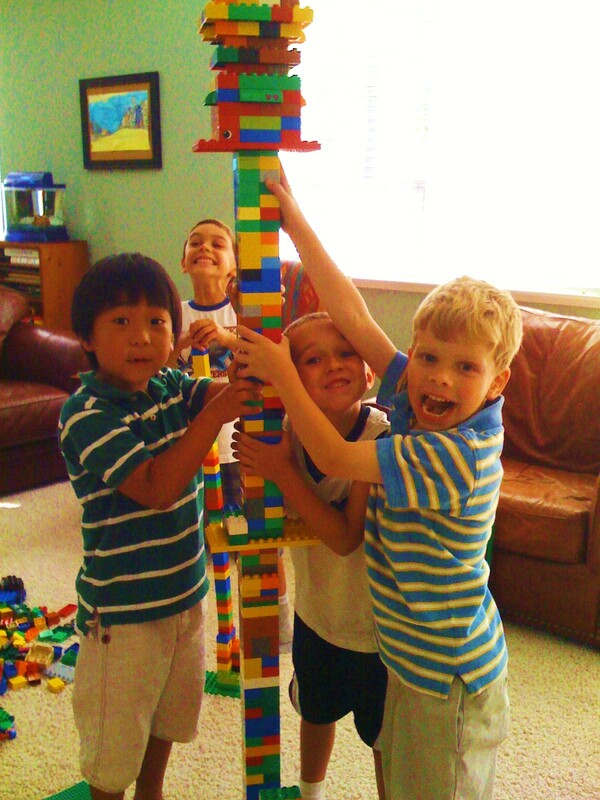 If you're planning a LEGO-themed party, here are a few ideas we've tried. My son asked for a LEGO Star Wars theme for his 7th birthday. At the time, there were lots of Star Wars-themed party supplies and LEGO Ville-themed party supplies out there (which were a bit too young for my son), so I mixed the two themes together. For the birthday cake, I ordered one from our local supermarket. I asked the baker to decorate it with rectangles in red, yellow and blue, with confetti on top. Then I took a couple of small LEGO base plates and built scenes with some LEGO minifigs on it. I sat the LEGO base plates on the top of the cake as cake toppers, and later placed birthday candles around them. 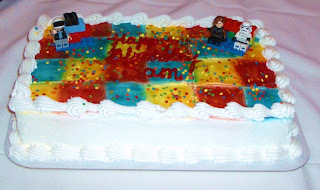 Note: If I ever design another LEGO cake like this one, I'd like to trying adding the LEGO studs on the rectangles using a straw to poke round holes into the icing on top. I'm not sure if this would work, but it's worth a try. 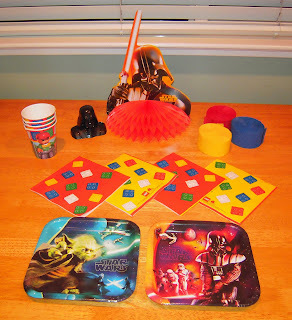 I bought a mix of Star Wars plates and LEGO Ville cups and napkins with a solid yellow tablecloth from Party Express. I used plastic bowls in solid red, yellow, blue and green to hold party snacks. I bought a Star Wars centerpiece and decorations from the party store. My son also built some LEGO Star Wars sets and placed them around the house. I added streamers and balloons in red, yellow, and blue (LEGO colors). It was all very colorful! For games, my son came up with a couple of timed contests. 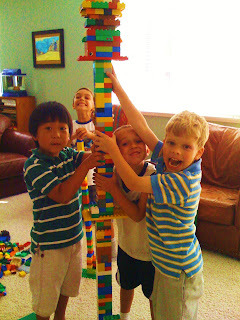 One contest was to organize the kids into groups, give them a big pile of LEGO bricks, and time which group could build the tallest (free-standing) tower in 5 minutes. For rewards, I handed out stickers. I also bought a few packages of minifigs--one minifig for each kid. And a package of Hot Wheels race cars--one car for each kid. I know this isn't a LEGO game, but we also got a bouncy house for the back yard during the party, to let them get some fresh air and let off some energy. If we have another LEGO Birthday Party, we have a couple of new LEGO board games--Minotaurus and Pirate's Code. The only thing is that they're really just intended for 2-4 players, and they take a while to play, so they're better suited for a smaller group of kids. I think the best games are a timed challenge that can be measured in some way. It's even better if you can find a group challenge. For example, one cool challenge we had was to build Santa's workshop as a group. We each built one Santa, one sleigh, one reindeer, and one elf. We built the workshop and toys as a group. We had a blast building this one! Another tip is to offer different games at the same time, because not all kids share the same LEGO interest or skill level. 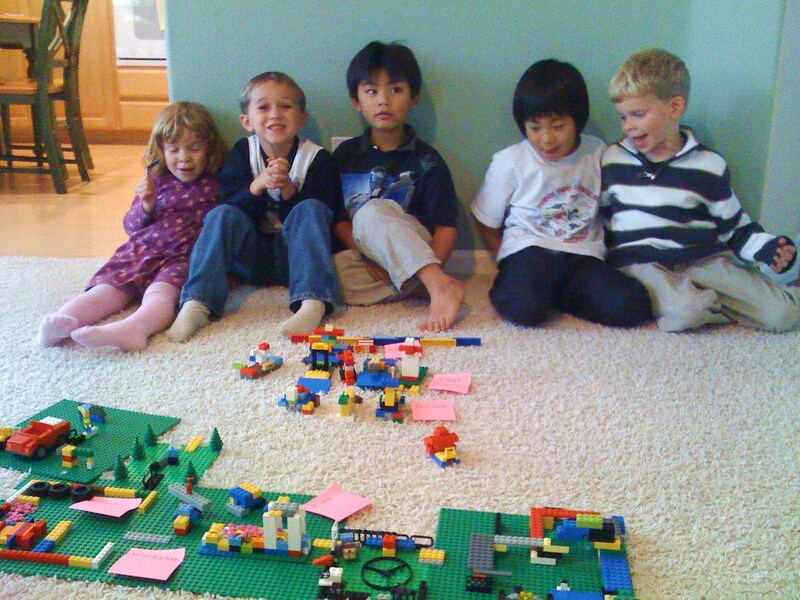 We've set up two or three areas where small groups of kids can work on different projects (using the larger LEGO bricks or simple LEGO kits and instructions). You might want to ask other parents to help supervise the different groups, depending on the age of the kids. For goodie bags, I bought a small bucket of LEGO bricks and gave each child a nice assortment of LEGO bricks to take home (in Ziploc baggies). The kids really liked that! As a final tip, don't forget to take lots of photos of their creations. Have fun with your LEGO-themed party!